A new and virulent disease is spreading around the world, and, so far, there is no treatment for it. It has spread into many nations, but it is hard to know how far it has spread because hospitals, treatment facilities, and even governments are hushing it up because they feel “there is no point in scaring patients –or prospective ones” (first link). 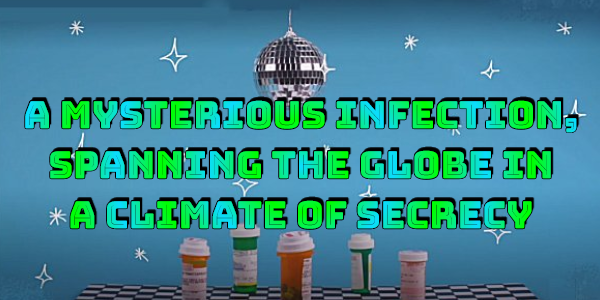 It is impossible to know how many cases actually exist due to the intense secrecy about the disease, but it can have a huge effect wherever it strikes. The first two links indicate that it first appeared in Japan in 2009, has spread to Venezuela, Spain, the United Kingdom, India, Pakistan, India, South Africa, and the USA. The disease is a fungal infection called Candida Auris, and it has manifested in at least four different forms. When it infects a health care facility, its effects can be devastating for the hospital or care facility. The first link reports that it “spread through a hospital in Spain [and] forced a prestigious British medical center to shut down its intensive care unit.” The links report that some patients have been so infected with Candida Auris that efforts to deeply sanitize their rooms after their deaths have failed to eradicate the fungus–which seems impervious to the usual anti-fungal treatments. Clearly, healthcare facilities and even governments have concealed information about this disease as it would be “bad for business” if their facilities were known to have the disease. Obviously, since the disease is so hard to eradicate in facilities that are infected with Candida Auris, prospective patients would choose to go elsewhere if they were allowed to know if a prospective facility was infected. The first link adds that there is an atmosphere of “hushed panic” among hospitals and health care providers about this disease. In America, the CDC did not issue any notice about the danger of Candida auris until 2016, but filings now indicate that at least 587 cases have been reported in the USA–mostly limited to the states of New York, New Jersey, and Illinois. Both the first two links report that the disease is easily spread and has a high lethality rate. Approximately half of all patients die within the first 90 days of infection. The true extent of the spread of this disease is not really known since hospitals and care facilities have a huge motivation to hide evidence about infected patients, and there may not even be an official requirement for infected locations to report cases of Candida auris. The second link reports that in some Chicago nursing homes, 50% of patients have already tested positive for the disease. Until all cases of this untreatable disease are required to be reported, it is evident that the true extent of its spread will be under-reported–perhaps greatly so. The first two links also discuss how this disease may have started. One theory is that this fungal disease has been around for some time and that it has just recently developed into a super germ due to the overuse of anti-fungal chemicals in various agricultural usages. However, the first link has this curious statement about the confusing origin and emergence of Candida auris: “Somehow, it made a jump almost seemingly simultaneously and seemed to spread and it is drug-resistant, which is really mind-boggling (emphasis added).” Perhaps it did emerge naturally and spontaneously due to overuse of chemical antifungals, but it is most odd that it seemed to emerge in four distinct variants simultaneously in various parts of the world and that is emerged in a drug-resistant form in all four variants right from its initial appearance. It is my view that the “mind-boggling” way Candida auris emerged in a highly-developed and lethal form from its onset and that it “simultaneously” emerged in widely-separated parts of the world requires that one other possible origin for this disease be considered. Given that it emerged in separate locations in multiple variants (all deadly) and that it was drug-resistant from its origin argues that it may be a man-made, bio-engineered disease. Given the widespread availability of scientific laboratory equipment, CRISPR gene-modification tools, and other advanced technologies, it is possible that either (A) some mad scientists developed this disease strain to be a lethal biological weapon and that it somehow (because it reportedly spreads easily) escaped from its laboratory confines, or (B) it was deliberately bio-engineered and released into multiple populations in various nations as a secretive bio-terrorist act. Since the origin of Candid auris and why it emerged so deadly from its onset are questions that are still unanswered, I hope that responsible government health authorities in affected nations will pursue all possible origins for it until its real genesis is confirmed. Obviously, finding a treatment is of the utmost urgency. Readers will notice that the first two links are both from the New York Times, and I recommend readers review both articles as they are separate stories with overlapping and different information. As an indicator of how intensely global governments and media sources have been suppressing this story, I’ve enclosed the third link which is a web search for this topic. Few major media have reported anything about this spreading fungal plague, and some of the sources simply reprinted one of the stories contained in the first two links from the New York Times. The Times is to be commended for publicizing this risk to the public. I think it speaks volumes about how deadly this disease is that governments and media sources have concealed this story for years. Clearly, they do not want to risk infected facilities going bankrupt due to prospective patients avoiding infected facilities and they do not want to risk scaring off tourists and businesses from infected locales. However, the disease is highly-lethal and the public needs to know the truth about it. Clearly, if anyone needs to enter a hospital for treatment or is considering entering a nursing home, the facility should be asked if it has had anyone test positive for Candida auris before entering such a facility. The emergence of this highly-lethal fungal disease in widely-separated parts of the globe does have a possible biblically-prophetic implication. It is very, provable, that we are now living in the biblically-prophesied “latter days” of our current age (see my article Are We Living in the Biblical Latter Days?). Many biblical prophecies for the latter-days have come to pass–some with amazing specificity. That prophecies which are millennia old are simultaneously coming to pass in our time cannot be a random coincidence. The only explanation is that the Creator God who inspired those prophecies is making them come to pass in our time because it is now in his timetable to bring our current sinful age to an end and begin a prophesied “millennium” or “Messianic Age” ruled by a Divine Messiah–which we Christians see as the returning Jesus Christ. Jesus Christ himself prophesied in Matthew 24:7 that “pestilences” would emerge and spread in the latter days, and the prophecy about the “four horsemen of the apocalypse” in Revelation 6:1-8 appears to be consistent with the prophecy in Matthew 24. The “pale” horse of Revelation 6’s prophecy appears to represent pestilences while the other three “horses” represent deception, war, and famine. All these same global phenomena are found in the prophecy in Matthew 24:3-7 about the latter days. Will Candida auris prove to be one of the prophesied “pestilences” of Matthew 24:3-8? We do not yet know but will have to wait and see how widespread this fungal disease becomes. However, the fact that global governments, media, and even health care facilities have chosen to conceal the existence and extent of this disease reveals just how scared they are of Candida auris. Since they have been too afraid to even speak of it, should we, the general public, be equally as concerned? It is long past time that the public authorities reveal the real extent of this spreading disease and that the media insist on having this information so they can inform the public. My thanks to a reader for tipping me off to this story.